'Scientific advice to politics', the 'nature of expertise', and the 'relation between experts, policy makers, and the public' are variations of a topic that currently attracts the attention of social scientists, philosophers of science as well as practitioners in the public sphere and the media. This renewed interest in a persistent theme is initiated by the call for a democratization of expertise that has become the order of the day in the legitimation of research funding. The new significance of 'participation' and 'accountability' has motivated scholars to take a new look at the science - politics interface and to probe questions such as 'What is new in the arrangement of scientific expertise and political decision-making? 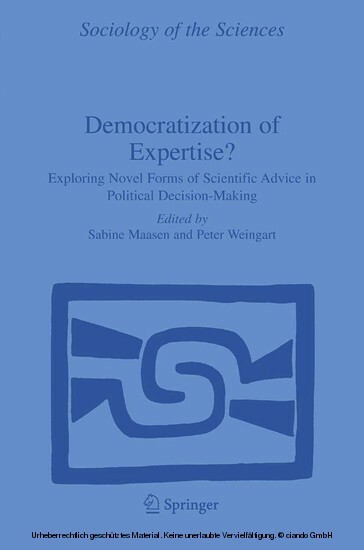 ', 'How can reliable knowledge be made useful for politics and society at large, and how can epistemically and ethically sound decisions be achieved without losing democratic legitimacy? ', 'How can the objective of democratization of expertise be achieved without compromising the quality and reliability of knowledge?' Scientific knowledge and the 'experts' that represent it no longer command the unquestioned authority and public trust that was once bestowed upon them, and yet, policy makers are more dependent on them than ever before. This collection of essays explores the relations between science and politics with the instruments of the social studies of science, thereby providing new insights into their re-alignment under a new régime of governance.